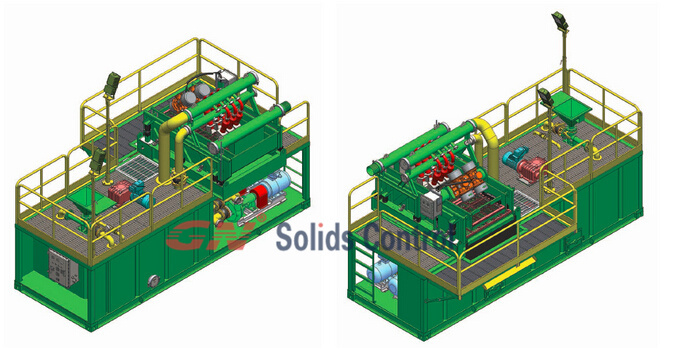 GN Solids Control is China & USA based leading manufacturer for mud recycling system. Recently, we exported 2 sets GN 500gpm mud recycling system to Egypt. The client is professional horizontal directional drilling contractor. They have tried our 200gpm mud system last year and give repeated order this year. 1) 1 set 4 panel shale shaker, GNZS594E-HB, This shaker with 4 panel shaker screen can have high performance when treating drilling mud. The composite material shaker screen is replacement screen for Swaco Mongoose screen, but more cost-effective, better price and good quality. 2) 1 set mud cleaner, GNZJ594-2S12N. The mud cleaner is combination of down deck shale shaker with 4 panel shaker screen & 2 desander cones & 12 desilter cones. This is combination of second phase treatment & third phase treatment. GN Solids Control can also offer mini mud cleaner, with much better price and good performance. Read more of GN mini cleaner from GN website. 3) 2 set centrifugal pumps for feeding desander cones & desilter cones. GN centrifugal pumps can also work with mud hopper, mud pump etc. Sometimes, client use our centrifugal pump as diesel pump for short time. 4) we one pipe to connect the shale shaker & mud cleaner, butterfly valve controlled the opening. When client have a bigger overflow, the client can distribute the drilling mud to mud cleaner down deck shaker directly. In this case, the treating capacity can reach to around 700gpm. GN Solids Control have over 5 years jobsite experience on compact mud system design & manufacturing & after sales service. Our system is widely used in China ( CPP), Australia ( TT Aisa), Mongolia, Middle East, Israel, Egypt, Sudan etc. Good quality equipment win good reputation and repeated order for us. If you have any requirements, pls contact us freely.